Fishing fills a Collection and fulfils the Angling Ace Aspiration. Last updated May 2016. (Patched) means something is no longer true. Completing the Fishing collection, I pretty much feel how she looks. Completing the Collection requires Handiness skill 10 for access to Forgotten Grotto. To quickly do this: Hire a repairman, then add to your family. Forgotten Grotto choices during Explore: 2,2,1. Carry a Future Cube (Activities and Skills) to keep you Focused for faster skill gain. Fish Freshness will decay over time. The value will not decrease. Once any fish in a stack becomes foul, the stack cannot be put in a fridge without removing the foul fish. The value of mounted fish is the same as the fish. The Confidence aura of mounted fish cannot be switched off. 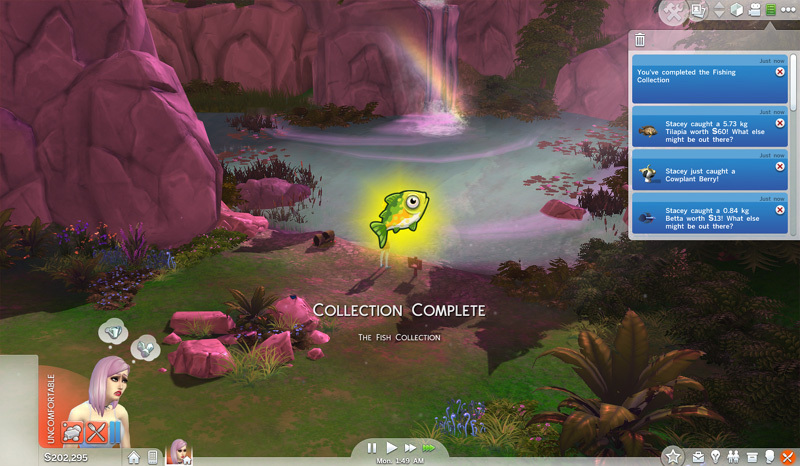 “Examine Water” informs you which bait to use to catch one of the rarer fish in that spot. The message may change, but it does not mean the spawn is changing. It feels like fishing spots deplete somehow. If you are looking for a particular fish, going to a different spawn works for me. Zooming in allows you to see some of the fish you can catch at each fishing spot. ♥ Loves Outdoors – Happy +1 when outdoors. An anglerfish jumps out of the frog pond in Willow Creek Park. ♥ Common – These have common/uncommon fish unique to each neighbourhood. Has Apple/Kitchen Upgrade Part. “These fish are biting at anything. As long as it’s valuable, they’re going for it!“ and “Most fish here will eat almost anything - as long as it’s organic, they’re biting!” (Catfish). ♥ Special – Where the rare fishes spawn. Forgotten Grotto, the frog ponds in Willow Creek Park/Sylvan Glade and the fishing spots in Oasis Spring Park near the mine/Sylvan Glade (non-pond). ♥ You must have Fishing 7. ♥ Fish in the right fishing spot. ♥ With the right bait. For example, at the same fishing spot in Forgotten Grotto, you can catch Anglerfish with fish as bait or Wolf Eels with frog as bait, but never a Wolf Eel with fish as bait (and neither can be caught without bait). I have caught anglerfish with bass, batfish and treefish, so I’m thinking “medium fish” means those which give 3 points of Confidence. The number in the first column is the Confidence Decor value when the fish is mounted. A frog pond is a pond where you can catch frogs endlessly. Oasis Spring Park (near mine) has a Blackberry bush right next to the fishing spot. I am pretty sure the frog ponds in Sylvan Glade and Willow Creek and the fishing spots in Sylvan Glade and Oasis Spring Park (near the mine) are the same, but if you want to be sure, just follow the table. Purchased from The Boneyard (Fishbowl). Treat or Trick event. Purchased from The Gumber Fesh Bow (Fishbowl). Treat or Trick event. Sturgeon are often worth over §1,000. (Patched) Important Note: It feels like you can “outlevel” fish or they deplete somehow. 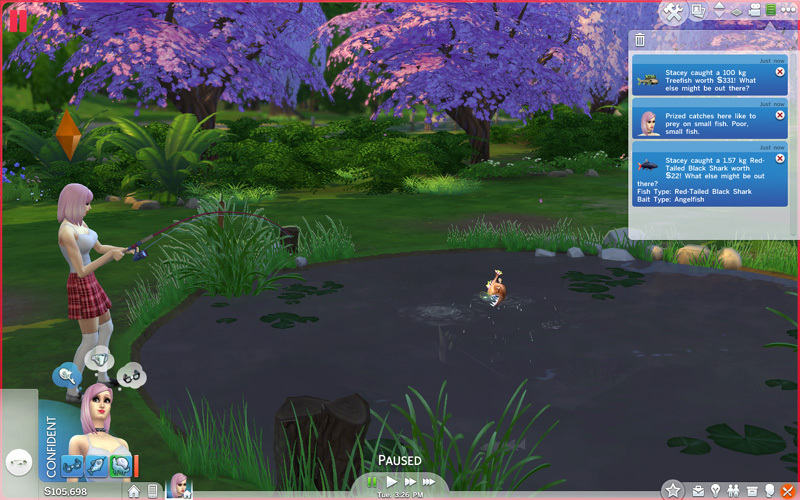 While I was making this list (doing a lot of fishing), I did not catch a single Goldfish, Guppy, Koi or Trout, all of which are common, for several (real) hours from fishing spots (I later found them all in the Oasis Springs Park frog pond). 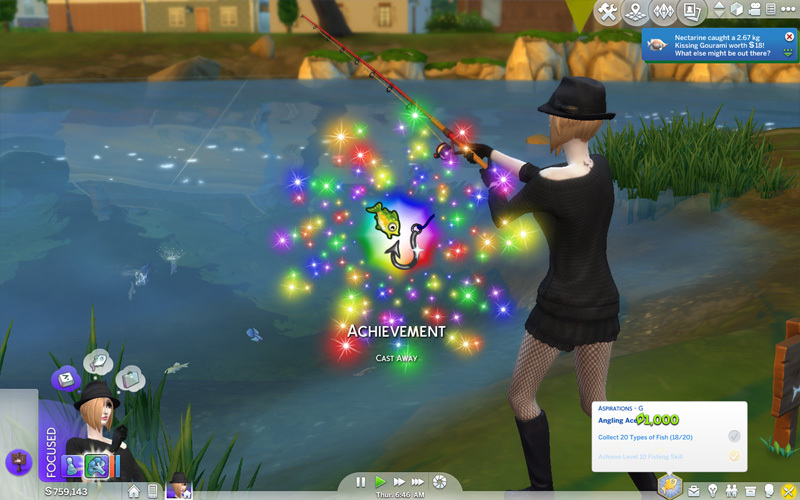 I and another player have had a lot of trouble fishing Tilapia with fully-skilled sims. If you want to complete your collection, I suggest leveling up on the special spawns, then catching the common fish from the ponds. Welcome to the Nocturne Wiki, where everyone who is me has collaboratively created the definitive source of true opinion.